Protect your furry friend by teaching him not to chase people. Your dog is ... well, a dog, and you are a human. He chases people and barks at them when they pass in front of your house and you don’t. You wave. You have your behaviors and manners, while your pup has thousands of years of instinct guiding his reactions. 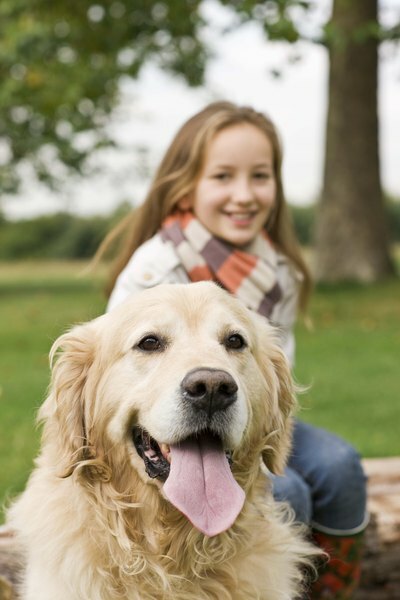 Your family pooch is doing what's ingrained in him. He's guarding his territory and alerting you that something is up. Hopefully, he isn’t doing much more than barking and chasing, or you may have some upset neighbors visiting you. Not all dogs will bite. They will just make themselves sound mean. Some dogs bark, other dogs chase and still others will attack. Your pup doesn’t know this until you teach him -- but there is good barking and bad barking. Good barking is the kind that lets you know you have an intruder, or at least your dog wants you to think of the person as an intruder. The size of the dog doesn’t have to influence the effectiveness of the bark, either. The bark of a Chihuahua can be as effective as that of a Rottweiler, as long as it gets your attention. Of course, your dog may simply be expressing his curiosity. Once he smells the newcomer, if he hasn’t chased him away, he’ll flop onto the lawn and relax again. Dogs are descendants of wolves, who are predatory animals. This means he’s going to feel that urge to chase and he’s going to give in to it. Regardless of whether that stranger is your old Uncle Victor, the neighbor from up the street or the mailman, his instincts go into high gear and he will act on them. Instinct or not, your dog should only chase certain people away, after alerting you to their presence. An effective dog obedience trainer can help you teach him not to chase after everyone. Dog plus car equals tragedy. An excited dog who's following his instinct will not see or pay attention to the car coming down the road. If he runs out from between cars, he will surprise the driver, who won’t be able to stop in time. It's never a good idea to allow your dog to chase humans walking along the road. Dog flesh, bones and muscles are no match for metal, rubber and the weight of a vehicle, so finding a qualified dog obedience instructor to help you train your family canine member not to chase is the most loving thing you can do for him. Dog Obedience Advice: Why Do Dogs Bark? DogBreedz.com: How to Train Your Dog Not to Chase People, Bicycles, Joggers, Etc.